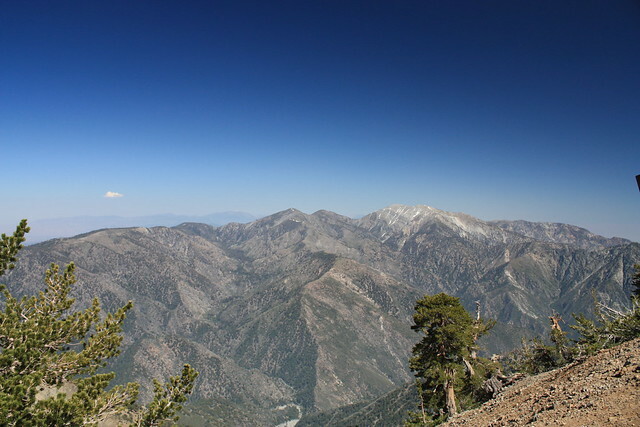 A moderately challenging 8-mile trek up the north face of one of the tallest mountains in the San Gabriels. 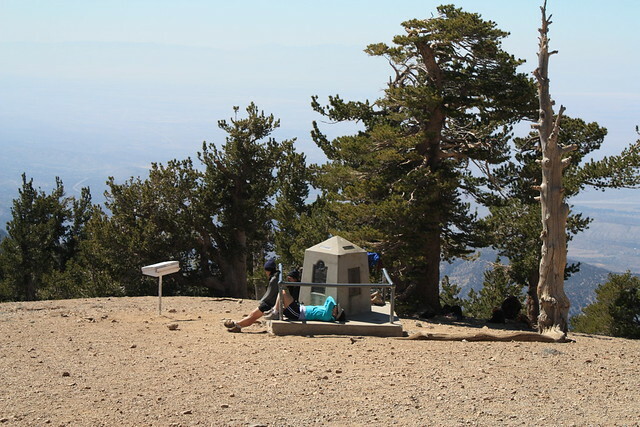 Fans of switchbacks will love the march to the top of this peak, which rewards hikers with a stunning ridge, 1500-year-old limber pines, a small monument to the founder of the Boy Scouts, and a mostly-bare summit with tremendous panoramic views of the landscape. 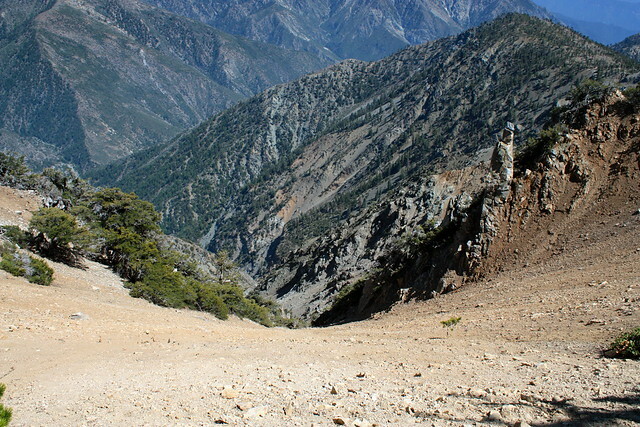 A popular trail, but definitely on the list of must-dos for the Angeles National Forest. 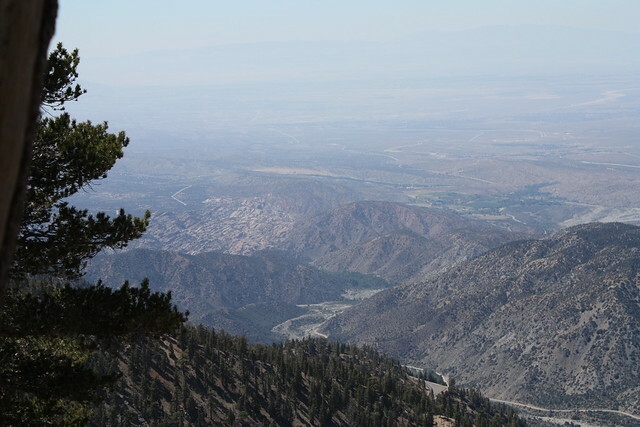 NOTE: The Angeles Crest Highway is often closed in the high country during winter or after rainstorms. Check the CALTRANS site for highway 2 conditions before you drive up there. The trailhead is clearly marked from the road, and has a large parking area and outhouses. While this can be a crowded trail – popular with day-hikers, backpackers, Boy Scouts, and Pacific Crest Trail through-hikers, don’t let that discourage you from hiking it. There are also a few other trails that leave from this parking lot – so don’t worry if you see a lot of cars when you pull in. 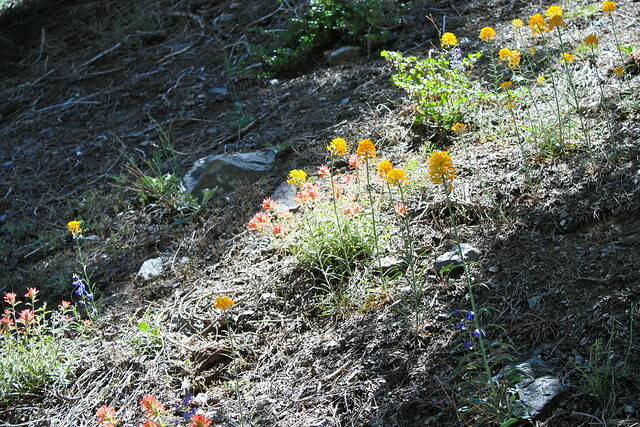 Head toward the western corner of the lot, then hop on the Pacific Crest Trail and start hiking. 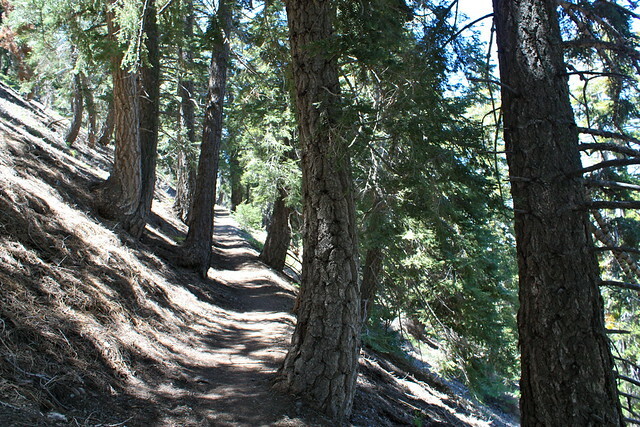 The trail is mostly shaded by pines at this elevation, and has a moderate but very consistent grade. You’re not going to find much flat ground to rest your legs, here. Just count the switchbacks and you’ll be fine. 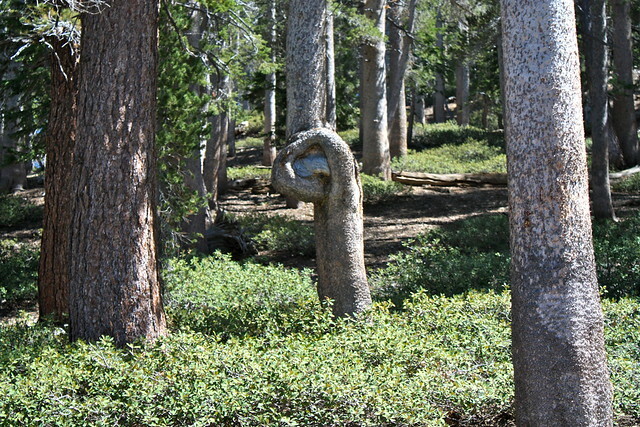 The scenery of the trail is nothing spectacular for most of the trek, but the thick evergreen forest is a very-welcome respite from the drudgery of city life, and as you ascend, you’ll be able to see more of the Antelope Valley to the north or, if you’re lucky, some leftover wildflower blooms. It was around this point in the trail that I started encountering the last of the stubborn winter snow, still hanging on to the mountain in seemingly frozen snow-slides … or very tiny glaciers. While these little snowblocks started off as very small obstacles, they soon grew much larger, blocking large sections of trail, making it so I had to either climb over them or hike on some of the more directly-ascending use trails for a while. 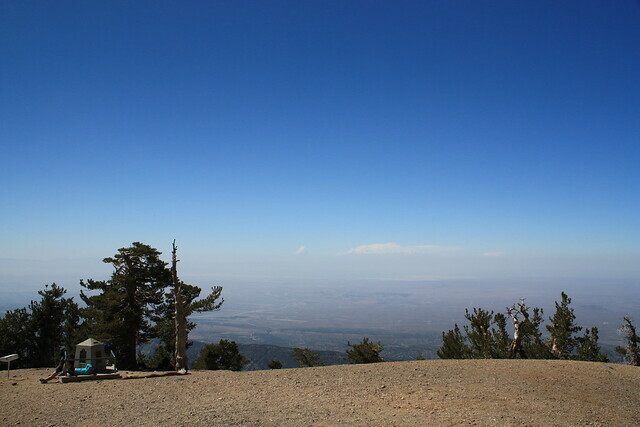 But it was at this elevation – about 3 miles in and just under 8500 feet – that the trees got more gnarled from the weather, and the views of the Antelope Valley to the north became much clearer. … if you look near the left of center in this photo, you can clearly make out the Devil’s Punchbowl. Viewed from this elevation, you can really see what a geological freakshow that place is, and how much it sticks out from the rest of the surrounding landscape. At about the 3.5 mark, the formerly just-pleasant trail takes a turn toward the dramatic. Here, a short, unmarked use-trail will lead you to a small, ancient grove of limber pines, some of which have been sitting on this windswept ridge for a thousand years. 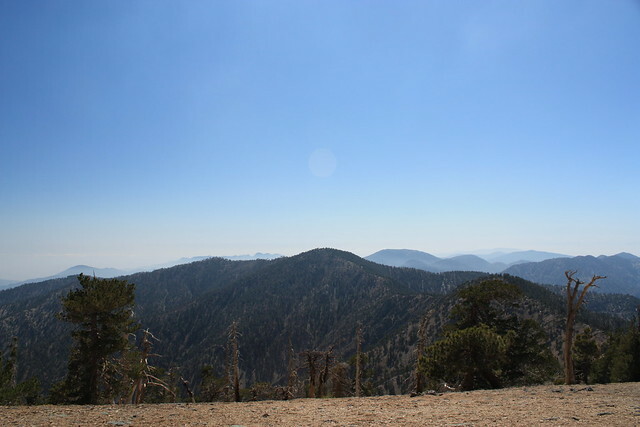 When you’re done getting your mind blown by the trees, your horizon will widen to reveal a breathtaking view of Pine Mountain Ridge and Mount Baldy to the southeast. … and when you’re done with that, you can look down to see the near-sheer drop of the ridge you’re standing on. I told you this part was dramatic. … all this, and you’re not even at the summit yet! When you’re done soaking in the views here, continue on the trail along a short summit ridge with a sharp drop to the left. 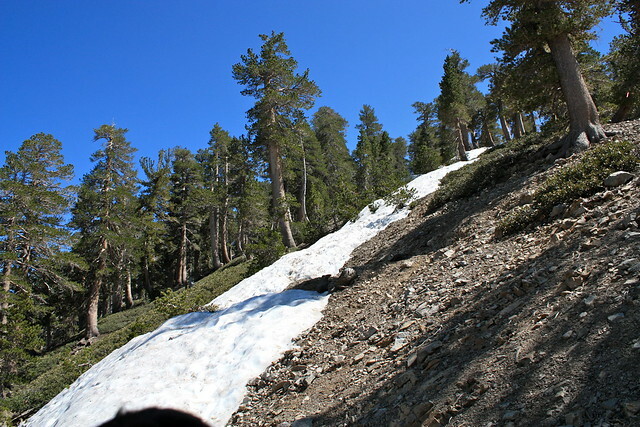 The Pacific Crest Trail bypasses Baden-Powell’s summit, heading west toward Islip Saddle. Ignore this and continue on the marked path toward the Baden-Powell summit, making sure to take time out to stop at the “Wally” Waldron Tree. 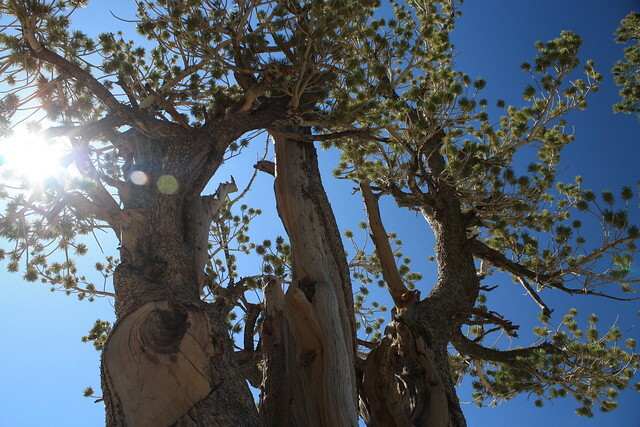 In 1962, Angeles National Forest Supervisor Sim Jarvi discovered the grove of limber pines here was over a thousand years old, and the Forest Service named a particularly impressive specimen after Michael H. “Wally” Waldron. 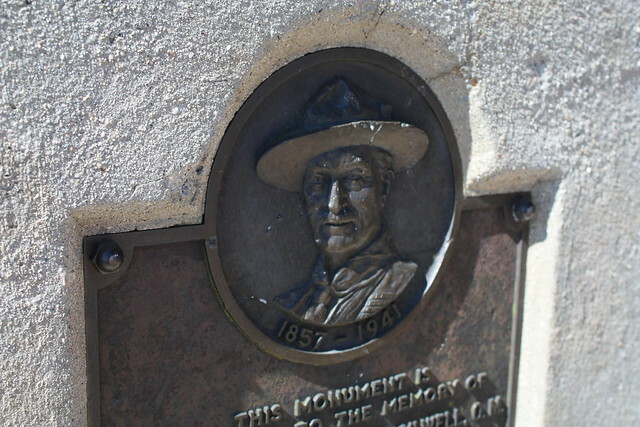 Waldron was an L.A. area Boy Scout leader who helped organize a nine-week project to repair the trails and erect the concrete monument and plaque to Lord Baden-Powell. 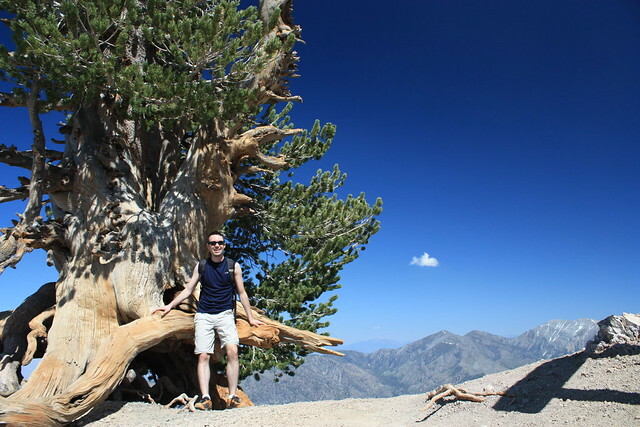 His gnarled, double-trunked tree clings to the summit ridge just beyond the point where the hiker briefly leaves the PCT and is believed to be the oldest living thing in the entire San Gabriel Mountains. From there, it’s less than a tenth of a mile up to the bare cap of Baden-Powell, adorned with a small concrete monument to peak’s namesake. Relax, have a snack, layout on the summit and enjoy the panoramic views, then head back down the way you came. Excellent. This is a well-maintained and well-traveled trail that's a popular route for day hikers and as a short side-trip for Pacific Crest Trail through-hikers. 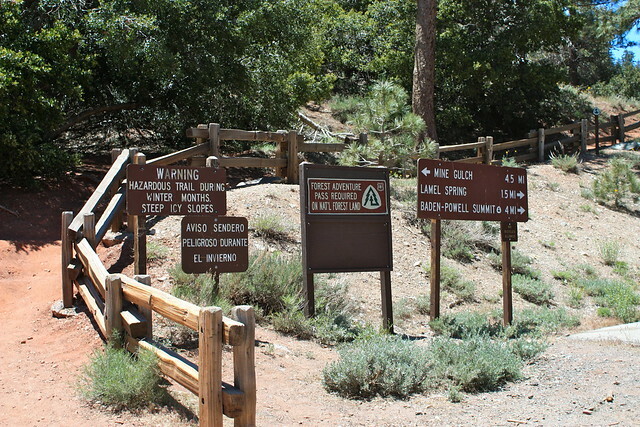 It's a single trail from the trailhead to the summit, with the one major junction clearly marked. 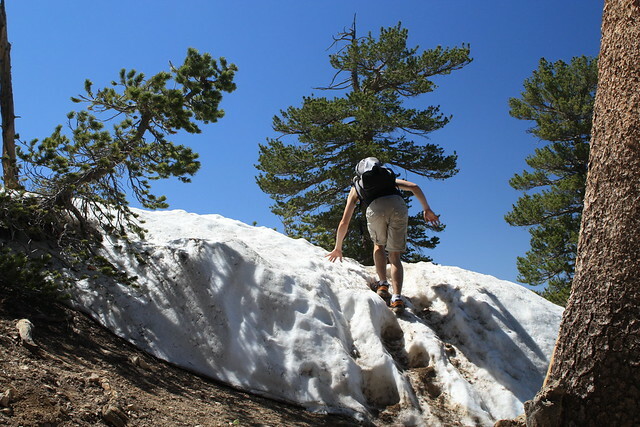 Parts of the official trail may still have snow on them late into the season, but there is an extensive system of use-trails to avoid these obstacles. I believe it is (it was certainly scheduled to be fixed by now), but you can check the CALTRANS web site for up to date traffic and road information on the Angeles Crest Highway year round. I heard the road was down to get to Vincent Gap - do you know if it's fixed now? Great hike! One of my favorites. I hiked this mountain for the third time because it is relatively easy, switchbacks for the first hour has flatness to catch your breath. The last mile is inclined but worth the climb once at the top. Two hours up 1.5 hours down. The top has flat areas to have a wonderful lunch. Went up there today, 11/23/15. Caltrans has closed Highway 2, just west of the Vincent Gap Parking Lot, due to the mudslide down the way. Spoke with a Cal-Trans employee who said he thought it'd be closed through next year sometime. So, access is from the Wrightwood side only. The trail has some snow on it, but we made it to the top and were rewarded with great views. The weather was pleasantly chilly, and things are supposed to get cold and windy up there tomorrow and Wednesday. Happy hiking! So I drove there yesterday, and there was no problems accessing the parking lot. Right after the lot, you can see they blocked off the 2. It was a very enjoyable hike, especially towards the top (took way too many photos). Thank you everyone for your help! 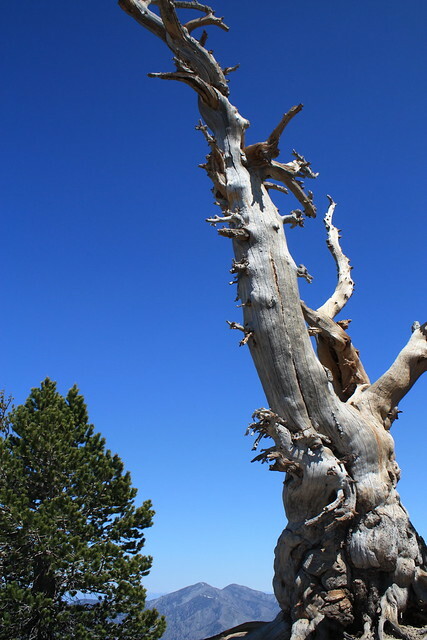 By the way, are there other areas to see the type of trees found at the top (the limber pine trees)? Thanks for the update Casey, I called, but neither could confirm if the parking lot was also cut off. The site says the 2 is closed between Islip Saddle and Vincent Gap, so I'm going to try my luck tomorrow. Steve, I also recently read (and posted on the Facebook account) that they'd also closed the 2 from Wrightwood due to some landslides. It's definitely worth calling in to either the ANF HQ or CALTRANS to check on that before you drive all the way out!